EU Commission Indexes for EMU Fall Again; What Is the Message Here? EU Commission indexes for the EMU area turned down broadly, falling for the straight third month. The five sector indexes saw declines in three sectors (industrial, retail, and services), a gain in one (construction), and unchanged conditions for consumer confidence. The overall index fell to 112.6 in March from 114.2 in February. The overall index was last lower in August of last year. Eighteen of the 19 EMU members report these indexes in a timely fashion. Of those 18 all indexes fell in March except for Belgium and Estonia. Nine of 18 indexes fell in February. France, Portugal, Malta and Slovenia report three declines in a row. However, the sector standings of index levels are still strong with the overall EMU reading and all sectors except services on a 90th percentile or higher standing. The services sector, however, has only a 70.9 percentile standing. The sectors are generally back to their August-September values with the run up to a peak around December now a thing of the past. The country-by-country tabulation finds seven of nineteen with standings in their respective 90th percentiles, five in their 80th percentiles, four in their 70th percentiles, and two in their upper 60th percentiles. And then there is Greece with a 35.9 percentile standing. Greece is the only member with an index level below its historic average, at 99.3% of its average. The EMU gauge is standing 11.7 percentage points above its average. The industry gauge is strong on very strong components readings for order volume, the production trend, employment expectations and export orders. However, production expectations are bit less ebullient and selling price expectations, with a 70th percentile standing, are moderate. Among the Big-Four economies industrial sector readings have a 90th percentile standing in Germany, an 83rd percentile standing in Spain, a more modest standing of 81st percentile in Italy, and a 77th percentile in France. 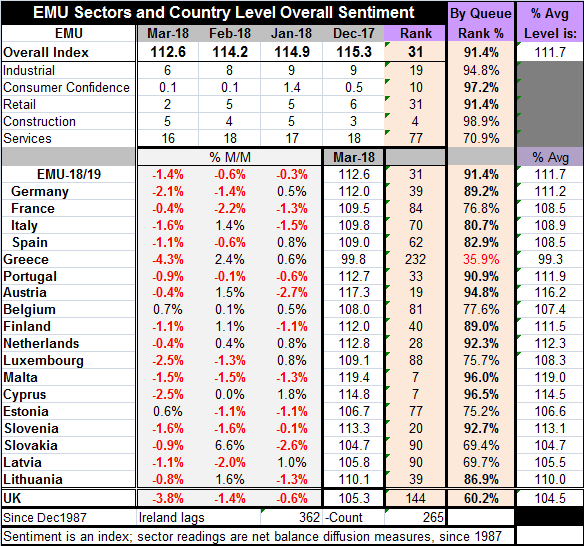 Consumer confidence is exceptional in the EMU especially given the momentum backtracking and political conflicts boiling in Germany, Spain and Italy. Nonetheless, the economic situation over the next 12 months has a very strong standing as does the situation over the past 12 months. The environment to make major purchases is very strong; expectations are for it to stay that way with little slippage. Expected price trends are modest with a 66th percentile standing. The services sector has a weaker standing with weakness emanating from expected demand that has only a 64.9 percentile standing. Germany’s services sector and France’s services sector have only 66th percentile standings. The standing for Italy is in its 86th percentile and for Spain it is in its 71st percentile. On balance, the EMU is doing well, with only one country reporting weaker than average conditions and most with standings in the upper 60th percentile or much higher. But momentum is being lost and it is hard to gauge the degree of slippage. The EU Commission indexes continue to track the Markit PMI gauges closely. EMU money and credit data also were issued today and they dovetail into the theme of slowing momentum. Money and credit in the EMU are weakening their growth especially when adjusted for the impact of inflation. On that basis, money also is slowing globally and credit to residents in the EMU is failing to keep pace with inflation. Real money balances are shrinking in the U.S. as well and decelerating steadily from 12-month to six-month to three-month. The money growth rates are shrinking over three months in Japan and decelerating on the same timeline as for the U.S. The U.K. data hint at a slowdown but have no clear trend. With central banks poised to transition to or toward normalcy and with the Fed in the U.S. now well along that path, the fading growth in real money balances is not a phenomenon that clearly supports these policies. In the U.S., credit growth also has become and remained quite weak. Inflation globally and in all major markets (except the U.K.) is undershooting. Yet, central bankers are fixated on raising the level of rates back toward normalcy. Not only are stock markets unstable largely from unrelated policies and concerns over trade policies, but the erosion of momentum in such things as the EU Commission indexes in Europe, and in the UK, the loss of momentum in global money growth rates, and weak readings in the GDP-now-casts in the U.S., all do the equivalent of raising their eyebrows not just on Fed policy in the U.S. but on the degree of unanimity there seems to be on the need to return to normal... and to do so now. But the question remains: how can you get back to normal when you do not know where the new normal is? Oh, don’t bother you with such details? Then never mind.